4 December 2017: World’s wildlife trade regulator focused on front-line action. Pangolins, whales, elephants, precious timber on the priority list for 2018. 15 June 2016: 100 days left before the World Wildlife Conference – CITES #CoP17 – kicks off in South Africa! 1 July 2014: Central Asian border controls lifted. Wildlife trade under the spotlight. 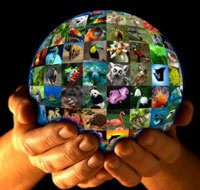 3 March 2014: People around the world go wild for wildlife! 16 March 2010: Internet – good or evil for wildlife?